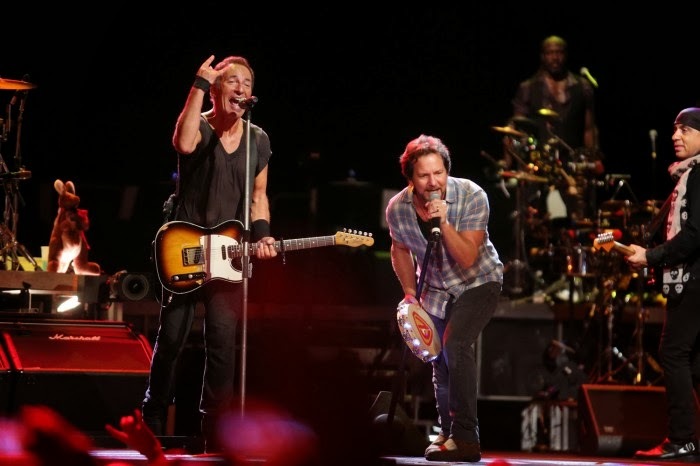 Pearl Jam frontman Eddie Vedder joined Bruce Springsteen in Brisbane, Australia Wednesday night for a cover of the AC/DC classic, “Highway To Hell”, and video of the performance is available. The Brisbane show marked the final date of Springsteen’s Australian tour in support of his new album, “High Hopes”, and the second time Vedder joined the rocker on the trek for the AC/DC track – they also played it in Melbourne on February 15 (see video here). Vedder wrapped up a solo tour of the country last weekend, following recent shows there with Pearl Jam. Springsteen now moves on to New Zealand for a pair of concert this weekend.